So we now have just four races left of the MotoGP season and it is all still to play for. You have to make Jorge Lorenzo an overwhelming favourite to win back the title he last held in 2010, but Dani Pedrosa cannot be counted out just yet. 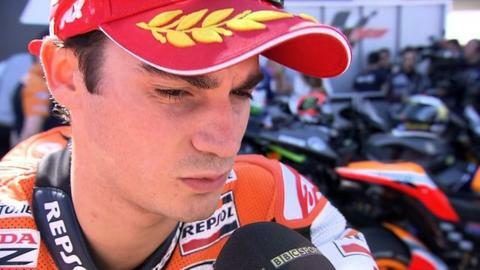 Pedrosa was clearly the fastest man and has been the fastest man for the last few months. all the more annoying because if he had kept his bike in one piece we would have a right old tussle on our hands. I think Pedrosa will take some beating now in every race, and the fascinating thing now will be the part that Casey Stoner could play in all this. The reigning world champion is Pedrosa's team-mate at Repsol Honda and for the next race in Japan on 14 October. We should hear next week if Casey will race in Japan in a fortnight's time, but everyone I spoke to at Honda was pretty confident that he would be back and that is certainly what they are planning for. He will want to be back because he is desperate to win his last-ever race in Australia at the end of October and he could do with a race to get some fitness back first. Casey can be in the mix at the front from the off and if he can finish ahead of Lorenzo and take those extra points away from him then we could go right to the wire. Lorenzo is 33 points ahead with four races left. If Pedrosa wins every race and Lorenzo can only finish third in each race, then the Repsol Honda rider will collect 36 more points than Yamaha man by the end of the season and win the title. That is how close it could become, so Lorenzo has got to start thinking about winning again. It wasn't a great afternoon for Nicky Hayden who had a really big accident. We haven't had any confirmation of his condition yet but he will be seriously knocked about after he went into a solid barrier and was thrown clear over it. I do not know for the life of me why he did not bale out. Every time I have been heading for something solid on a bike, I have laid the bike down and slid along the ground. That is why you wear leathers. "Arm pump is a plague for motorbike riders, it is like cramp and it affects different people at different times. These guys all have massive forearms, you need to to stop these bikes from 210mph, and sometimes the muscle gets too big for the sack that it sits in." I can only assume that he thought he was heading for an airbag fence but he wasn't - it was a solid hoarding. He was carrying a few injuries before this weekend and that crash will not have done him any good at all, but it has been revealed he will recover in time for Japan. Speaking of riding with injuries, Scott Redding was back just eight days after having an operation to cure and came third in a brilliant Moto2 race. He said that he could feel the scar opening up during the race but he carried on. Incredible.